Let’s be clear about one thing, Standard is changing. The full Theros spoiler is out and if you’re like me and playtest decks on Cockatrice, you’ve probably been playing with most of it for weeks. I don’t think in the years I’ve played magic off and on since Revised do I remember a base set that came in and had such an immediate impact on a Standard format. There’s sets that have come in and had some powerful cards that were used right away, but the vast majority of this set seems immediately playable and I’ve seen some wild brews online along with great updates on traditional contenders. I’ve tested a variety of brews, and have been tweaking those over the course of time. I don’t think any single one of them is ready for prime time, but a few of them are close. A lot of folks in my area and elsewhere have been talking up Mono Red, thinking that it’s going to dominate this format. 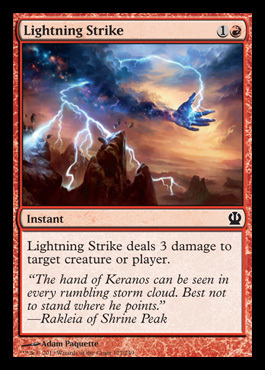 Personally, I think red has its work cut out for it; there is a lot of resistance in Theros, and some of the new cards might seem cool but really require some work to build around. I’m going to take you on a tour of some of the decklists I’ve been working with along with the cards that they feature. At the end, I’ll cover some of the format’s obstacles, and please feel free to comment on what you think would be a good way to defeat them. There’s not really a feature card for this deck, it’s your traditional balanced Mono Red Aggro deck. While a lot of people online and in tournament play immediately go for the Burning-Tree Blitz route, I’ve always felt that it was largely unnecessary. You’ll overwhelm a handful of opponents with that type of deck, but at the competitive level you give yourself no advantages play-wise aside from some nut draws. This deck looks to give you the power of flexibility in attacking from multiple angles (Phoenix, Chandra, Stormbreath, Loyalist, Burn, Mutavault) while still being very aggressive. Its tested better than most of the lists I’ve been running, and the only change I’m currently considering is to put Boros Reckoner in the maindeck. He seems very strong in this format out of the gate and he’s easily better in the Mirror than some of the other cards. It will depend on the metagame, and if what I’ve played online is any indicator there will be some variety. You also still have access to x4 Flames of the Firebrand which is great against the mirror. This list doesn’t embrace the new cards, but the ones it does use are arguably what I’d say are the most powerful for this shell. Purphoros is still in the heavy testing phase for me and is largely a build around card, so in this list he’s just an extra pressure point for the control matchups out of the board. Arguably, this has been the most successful Mono Red list I’ve piloted thus far. It’s pretty much a direct port of the old Big Red that I was using, except we’ve upgraded some power levels. 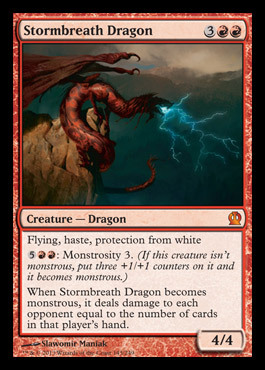 For starters, Stormbreath Dragon is often a better Thundermaw Hellkite. In the matchups where Mizzium Mortars or Doom Blade is not present, he usually goes unchecked; either killing them outright or letting you activate Monstrosity to ensure they’re finished off. Purphoros actually is a creature most of the time in this deck, as the supplementary early drops that you play tend to stick around. Initially I was using Ash Zealot like in my old list, but Frostburn Weird has been nuts for me. I saw him in some articles and decks online for UW and Mono Blue, and remembered that he was occasionally a good anti-aggro sideboard card. Well he still serves the latter role, but he’s also great at punishing slower opponents who are using the new scry lands and/or guildgates. Purphoros has been a creature in this list more often than not, because Frostburn Weird plus any of your three drops will activate the needed devotion when he comes into play. Having a 6/5 Indestructible in red has usually been far too much for my opponents, and even if they remove him or you can’t get enough early critters down, Chandra typically functions as a great later play to trigger Purphoros anyway and remove any would-be blockers. Spark Jolt is very much on the test bench still for this deck, and with Scavenging Ooze and other annoying creatures running around it might have to get cut. I saw a lot of Mono Red Aggro decks online using it, so I decided to try it here alongside Magma Jet, Chandra, and Portent of Betrayal to give this deck a solid cycling engine. While it’s not true draw power, the old version of Big Red had the occasional issue of just not being able to keep in a game with some decks because it had no way to filter through its cards, and so far having access to this much scry has really aided that issue. Anger of the Gods is one of the most impressive cards to me in the new set, but in this list it hits a lot of your own guys which typically makes it not the card you want. You can play carefully if it’s in your hand, but I don’t think it’s a four-of here. Still, there will be those insane blitz decks that you may just want something that hits their entire board. This deck is mostly a brew, but I heard some stirrings about Goblin Rally with Purphoros and Young Pyromancer and naturally the Timmy in me had to try it out. People floated around other ideas too, like Legion’s Initiative and Assemble the Legion, but for us die hard Mono Red players, other colors just won’t do. This deck has had some hilarious games online, I’ve had multiple times where I’ve just cast Purphoros on turn four, Goblin Rally on turn five to do 8 damage, and then played a land on my sixth turn followed by a swing for the remaining 12 life points (double-pumps with Purphoros). You have a lot of burn to clear blockers, and if they aren’t able to get rid of Young Pyromancer before he puts in some work, you’ll usually have some creatures on the board to supplement your late-game army. My biggest problem with this list though is that it’s fairly one-dimensional and the mana curve is somewhat clunky although it’s not too far off from traditional Big Red. I think there’s a lot more you can do here though, because the combo alone is worth playing a deck for it. It might be a little too early to go full-blown on a Heroic deck, but I’ve seen a lot of people try online in a lot of different colors. Here you’re only running Akroan Crusader for the effect, but Ordeal of Purphoros and Madcap Skills are fairly good on their own if you play them around your opponent’s removal. 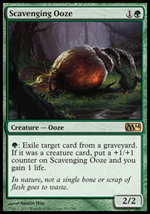 You certainly take some gambles on both the land count and the control matchup, but the explosiveness of the creatures and the difficulty you create to block them can compensate a bit for this. It’s a fun list, and worth playing around with if you prefer the faster red decks. It may need some tweaking on the non-creature side of things, but I think with the burn in the sideboard you can adjust for some of the more difficult matchups. This Mono Red Blitz deck is almost a straight port of what’s currently successful in MTGO’s RTR tournaments. You gain Firedrinker Saytr which can give you some greater reach, and Legion Loyalist is probably better than Akroan Crusader once you ditch the Heroic theme. This is the kind of deck that should be more powerful in the early stages of the format, but I would be very wary of Anger of the Gods. I’ve seen a lot of this card online, and being one turn faster than a Supreme Verdict is a huge deal. It’s one of the big reasons I don’t like the Blitzy route, especially now. Red has had to deal with these guys before, and unfortunately they’ve only become better. G/B and Junk both still have access to most of the good removal they had before outside of Tragic Slip, and now in addition to that they have a Hexproof 0/3 wall that ramps in Sylvan Caryatid. Firefist Striker, Burn, and Threaten effects can help, but at the end of the day the cards above are pretty challenging to beat on a regular basis. 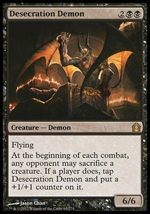 I’ve seen a lot of new Reanimator decks that use Whip of Erebos as both a reanimation tool and as a way to make Obzedat just absurd. My Big Red deck has no real answer for this at the moment, and a fourteen point life swing per turn is almost always a sure death. I’ve even seen people recur the Whip with Pharika’s Mender, or add to the threat level with Reaper of the Wilds. You could run artifact hate in the sideboard for the Whip, but it would be at the cost of threat density which is usually a big no-no for Mono Red. 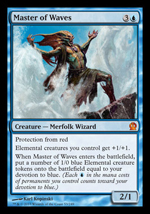 Master of Waves is often paired with a blue devotion deck. Most of the builds I’ve seen online have closely resembled the one talked about in this article by Ryan Hipp. Good luck beating this without putting in some Ratchet Bombs and/or Electrickery somewhere in your seventy-five. In one game I played, I had eight creatures on the board and was threatening lethal, when two Master of Waves and Thassa just completely destroyed me. Master of Waves seems like the new Lingering Souls, and the fact that he’s pro red is just icing on the cake against us. I expect this style of blue to be public enemy number one in the first stages of the format. There’s a lot of other stuff out there that has been interesting, from the new Planeswalkers to Mono Black Aggro to Mono White Heroic to updated Naya Midrange lists, so it will take some time to figure out a complete seventy-five and I’m guessing it’s going to be heavy adjustments from week to week. I look forward to any feedback on Mono Red, and while the road ahead looks difficult, I still expect a competitive list to surface in the very first weekend of major tournaments. Fanatic of Mogis, Purphoros, God of the Forge, and Stormbreath Dragon will not be denied their seat at the table. 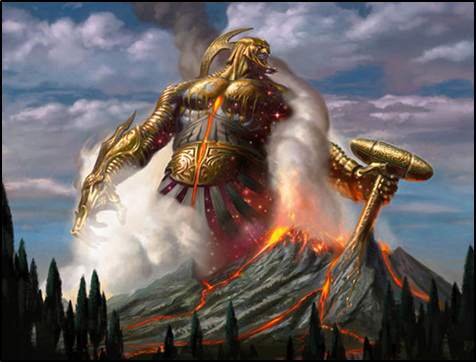 . .
We’re in the last days of a great Standard format, but the future for Mono Red looks promising. So far, of the spoiled cards there are multiple red cards getting attention from writers and players across the board, and the format looks to be slowing down due to the rare scry lands and heavier casting costs. I’m going to talk about the list that I’ve been playing recently pre-rotation and what I think about some of the future that lies ahead. While initially I had plans with my Magic team to attend the Minneapolis 5K, money and scheduling conflicts came up for many of us and ultimately only one of our team members was able to attend today. Sadly Magic is far from free, and being a red player partly because of budget meant that I too had to take other things into account. I’d also been playtesting a lot online and attending my shop to help out with various events over the past few weeks so I was getting a little of the burnout factor that all of us suffer from at times. I did get to play in our weekly FNM tournament last night though, which had a great turnout, and finished undefeated with Mono Red Aggro. I had been playing Big Red for weeks, but over the last few days I had been itching to play aggro again because the field locally and nationally seemed to be shying away from Jund and leaning instead towards Aristocrats, Bant Hexproof, Rock, and Selesnya. While the last of those isn’t a great matchup for aggro, the others are all winnable and people really seemed to be ignoring the need to beat weenie decks, which is when they are at their best. I had been incredibly frustrated with the majority of the Mono Red decks that I had tested on Cockatrice, mostly because they were so fragile and so reliant on perfect hands. Granted, that’s a common theme for aggro, but if you’ve read my articles you know that I like to have a little more “game” and “resilience” in my builds while at the same time maintaining the pressured tempo that can take advantage of an opponent who stumbles or isn’t prepared for it. When assembling my latest list, I took some cues from Big Red. Boros Reckoner and Chandra’s Phoenix have really performed well for me against the field; they are sources of damage which most opponents just simply don’t seem to have answers for the majority of the time. Most Mono Red decks decide to settle for one of these three drops in favor of going the Burning-Tree route and keeping the curve streamlined for a low land count, but I knew that this is not the direction I wanted to go in. Burning-Tree, as I’ve said many times before, can be absolutely insane, but at the end of the day he’s just a grizzly bear. I didn’t want my deck to be focused around good hands with him in it, and I hadn’t been having as much success as I’d like with Young Pyromancer, although I will say that the build that top 16’d the SCG last weekend is excellent. 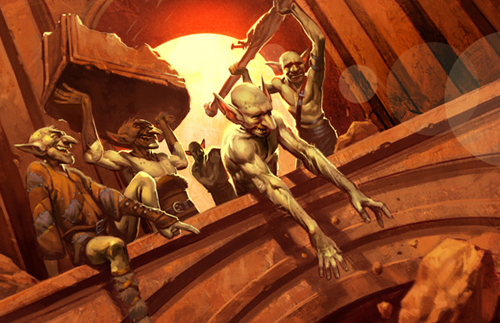 You can find that here – Mono Red Aggro. Furthermore, I have been playing a little bit of zombies recently and missed having a deck that included so many aggressive one drops, so that led me to playing the old “ten” in my maindeck for the new Aggro build. That combined with Mutavault and Ash Zealot would make up for not having a plethora of guys at 2cc. Lastly, as much as I love Thundermaw Hellkite, I wanted this deck to stay focused on the aggro angle, so I kept in more aggressive creatures and burn so that I had enough reach for stalled board states to make up for not having the big hasty 5/5 flier. A lot of Mono Red Aggro sideboards in the past few weeks have had x3 or x4 Burning Earth, Chandra, and other expensive cards but have not done much in the way of accommodating for them. For instance, I’ve seen builds that are either the Suicidal Blitz Red packages with these cards, which doesn’t really want these cards out of the sideboard because they just dilute the overall strategy, or regular Mono Red Aggro builds that don’t have the land count to support x6-7 four drops post-board. It’s possible the pilots of these decks were a lot smarter than me and had a rational line of thinking for how they were going to support the extra weight, but from my years of experience playing aggro I just was thinking of too many awkward situations in my head (and running into them in playtesting) where I would need to adjust the deck list to have it make more sense. Thus, I settled on 23 lands including 4 Mutavaults, because 22 is usually the right number for the typical build these days but 23 isn’t risking a flood when you have 4 Mutavaults. And 23 allows you to cast your three and four drops very consistently, which makes bringing in any number out of the board completely understandable. The maindeck worked out fantastically well, I was happy with how tough it slogged along and almost all of my opening hands put immediate pressure on my opponents. Even games where my opponent has had a Supreme Verdict or Mutilate to reset the board, Chandra’s Phoenix, Mutavault, and the reach of having so much maindeck Burn has usually brought the deck right back to where it left off. That’s the huge difference to the Mono Red deck I was playing back a few months ago around the time of Gatecrash Gameday. With that build, I had to play Pyreheart Wolf to offset the catastrophe of a wrath effect, but now that Phoenix and Mutavault are legal, I no longer have to run a card that’s mostly sub-par against aggro. I love Pyreheart Wolf, especially in Midrange matchups, but he is not Boros Reckoner. The sideboard needs to be changed, but I’ll touch on some of it. Skullcrack is there for a number of reasons. First, it’s one of the better ways to race Hexproof, because they can’t afford to sit back on defense with the amount of burn and flying power that you have (Phoenix + Stonewright), and if they try to race you with Unflinching Courage often one “fog” for a turn will be enough to give you the match. Secondly, Thragtusk decks never like to see it if you’re prepared with one in your hand, and these days B/G Rock has been that deck for the most part. It’s very easy to spot when they’re going to play a Disciple of Bolas or a Thragtusk, and I wanted to take advantage of these situations. It’s not like the Blitz Red decks where you hate to sit back with open mana and would rather play a guy, because in my build you have a lot of creatures that are fine just plowing along by themselves while you hold back mana for Burn in general or for pumping up a guy with a Stonewright. Thirdly, Skullcrack is always an excellent swap for weaker burn spells or creatures in the Control matchups, so I don’t mind maxing out on them when there are so many decks right now where it proves effective. Traitorous Blood was a concession for the popularity of decks at my FNM with huge creatures, but all of those decks present multiple lines of attack so I don’t think I’d want three in the future. One would have been satisfactory as there are just too many cluttered board states where it’s sometimes not what you want. I think it’d be better served as Ratchet Bomb which is good against Aristocrats, Hexproof, and Selesnya Tokens despite it killing off some of your own stuff. The rest of the sideboard is all 2-ofs against various matchups that just need a sliver of extra boosting, mostly some more burn against aggro and some extra problem cards for control and midrange in the form of Burning Earth and Chandra. Burning Earth has been impressing me less as time goes on, not because it’s not good, but because people REALLY GET IT now. So many decks have moved to two colors or less or are too aggro oriented for you to get far enough ahead to be able to afford a timewalk. In the future this could just be x2 or x3 Chandra, and not the 2-2 split. Cards I found myself usually siding out were a couple of Phoenixes, a few one drops, or whatever burn was not as efficient as the next one for the particular matchup. I also sided out a land when on the draw many times, as 22 is still reliable enough to hit just about everything in the deck. Overall, I ended up playing and beating Mono Red Aggro, Selesnya Tokens, Mono Black Control, and Naya Blitz. Going forward, this deck could pretty easily be modified for rotation as Pillar can become Shock, Searing Spear becomes Lightning Strike, and the other various cards coming out should find acceptable substitutes at their various costs. The real killers of course will be Hellrider and Stromkirk leaving, but Theros doesn’t even have everything spoiled yet. Just re-read them again, sit back and think about it for a minute. Both of these cards are very strong. Red doesn’t get many cards that feature those three words, or at least ones that are effective enough to pull their own weight and then some. 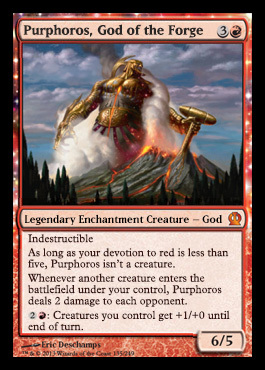 Sure, we get enchantments, but not indestructible ones, and not ones that have such a game warping effect as Purphoros, God of the Forge does. Part of me wants to yell at him, because he’s not Hellrider and doesn’t always help me tempo win on turn four against a backpeddling opponent. But then the more sensible part of me realizes that he’s just incredible. If he’s a creature, that means you have a lot of other friends on the board with him and that opponent is going to take a serious beating. If he’s not a creature, that means every creature you DO draw is going to be a shock to the face and potentially give you a 6/5. Those two points alone are enough to convince me that he’s worth the sticker price he’s seeing right now, and that’s not even mentioning the sick combos people have been talking about with him and Elspeth or him and Assemble the Legion, or the fact that he has a third ability which is absolutely relevant. All the gods in the set obviously look excellent, but Purphoros has the potential to be the defining break out rare if he catches on. There’s so many combinations with him in Red or outside of Red that just beg to be used, and at the bare minimum he will find at least one competitive shell. Stormbreath Dragon is just a better Thundermaw in many ways. Now that we don’t have to worry about Lingering Souls, losing the 1-damage tap down to fliers isn’t really a big deal at all, and while the 5-power damage output is slightly more important, he makes up for it by actually having protection from white which lets him evade most of the removal that would kill him outside of the stuff from Black which would have killed Thundermaw too. Oh, and what’s that you say? Angel of Serenity can’t target him or block him? Exxxxxxxcellent. The rising Archangel of Thune and the shiny new Celestial Archon don’t have anything to say when he’s on the table? Time to paint the town red. His Monstrosity ability though is easily the most important aspect. Most shells that are going to run him are going to be of the heavier mana variety, and that means hitting seven mana at some point relatively soon after he lands on the battlefield is going to happen with consistency. If your opponent couldn’t deal with him before, at 7/7, they really are going to be in game over mode. The damage he deals to the face is going to be nuts, as almost every deck in Standard (even Aggro) almost always sandbags cards these days. And if you already have a 4/4 flier out alongside a red army, it’s a fairly sure bet that those last few points of damage could very easily come from his ability. Lastly, it gives you a way to deal non-combat damage from a creature, so he’s essentially burn spells number 13/14/15/16 in your deck. I love how it says “each opponent” too. 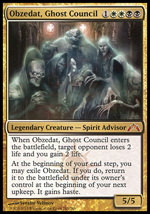 Can’t wait to play this guy in every format outside of legacy. There’s a few other cards that piqued my interest. Magma Jet, Akroan Cursader, Ordeal of Purphoros, Ember Swallower, and to a lesser extent Peak Eruption. Magma Jet was a staple once before and will be again, so I’m very happy to see it back. Scry is an incredible ability for red, especially with Chandra, Pyromaster’s “0” ability, and it should be an auto-four-of in most decks. 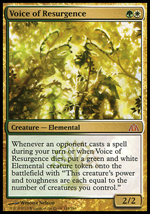 This is some of the most filtering power I’ve seen red have access to in a while, and it should help against what appears to be a very strong midrangey format going forward. Akroan Crusader and Ordeal of Purphoros are interesting inside of a Blitz shell, and I’ve been working on some prototypes with them alongside of Madcap Skills. A lot of decks are hampered by this combination, and it will really boil down to how much enchantment hate or two-for-ones are played in this format. Given that enchantments seem to be “stressed” in Theros, I’m hesitant to play this type of build myself but will still be keeping a watchful eye on it. Ordeal of Purhporos could somewhat make up for the disappearance of Stromkirk Noble, but it’s certainly not in the same league. Ember Swallower is mostly outclassed by what looks to be more powerful four drops, but he’s certainly in the discussion as he has the potential to just completely lock out the game if he goes Monstrous. What I don’t like is that he’s nothing more than a big body, and typically with Red anything four mana or above that doesn’t have some kind of really good added bonus is not going to see play. Peak Eruption is a great sideboard card against mirror matches, but all of the on-color hate cards are incredibly narrow so playing them will be heavily meta dependent. 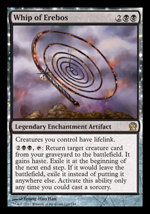 Don’t get me wrong, this is just a straight upgrade to Molten Rain against a lot of opponents, but I’d be incredibly uncomfortable running a playset in my sideboard or even x3. There’s just too much variety in standard for you to have something that only works against one color. I’d really like to see a more playable one drop exposed in the remaining cards and of course more burn is always a nice thing. I’ll miss Brimstone Volley and Stromkirk, those cards have put in so much work for me over the years. The next shot’s to you boys. . .
Now if you’ll excuse me, I have more Hellriding to do before the 27th.